The growing adoption of electric vehicles (EVs) is expected to cost Germany's key auto industry about 75,000 jobs by 2030, a study released Tuesday shows, with parts suppliers set to suffer the most. The adoption of EVs will lessen the importance of petrol- and diesel-fuelled cars, an industry where German carmakers have built a reputation for decades and which currently employs about 840,000 people, with 210,000 of them working on powertrain production (basically engines and transmissions components), said the IG Metal union, which commissioned the study along with BMW, Volkswagen, Daimler and a string of suppliers. Germany's car industry currently employs about 840,000 people, with 210,000 of them working on powertrain production, the sub-sector set to be the worst hit. The figures in the study, carried out by the Fraunhofer Institute of Industrial Engineering, were calculated on the assumption that by 2030, a quarter of all vehicles on Germany's roads will be fully electric. Another 15 percent is expected to be hybrids, which combine an electric motor with a traditional internal combustion engine, and 60 percent of the cars will be powered by gasoline or diesel engines that are more fuel-efficient than today. A more rapid adoption of electric vehicles could threaten up to 100,000 jobs, he noted, adding that regardless of the final number, there will be suppliers who won't be able to adapt their business model, especially among small- and medium-sized companies. Whereas it takes some 4,000 workers to assemble a million gasoline-powered engines per year, just 1,840 are needed to build the same number of electric motors, the study claims. And a battery factory requires only a fifth of the workforce when compared with an engine plant. 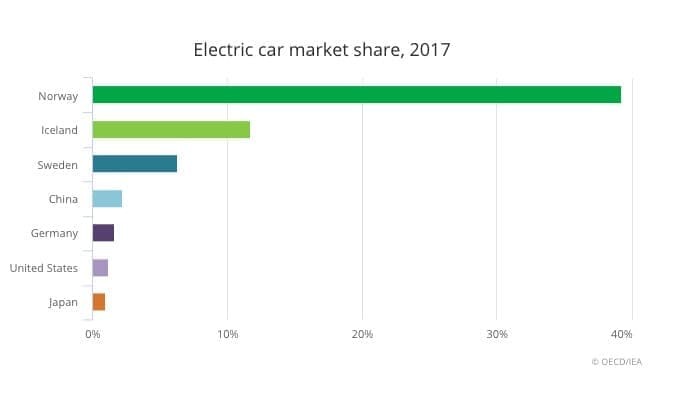 Source: IEA’s Global Electric Vehicle Outlook 2018. While relatively slow to catch onto the ongoing EVs boom, German carmakers have stepped up their efforts in the wake of Volkswagen's 2015 "diesel gate" emissions cheating scandal, which tainted the reputation of diesel cars and spurred a push towards more environmentally friendly engines. BMW recently said raw materials needed for car batteries will grow 10-fold by 2025, adding it has been surprised by "just how quickly demand will accelerate". BMW plans to offer 25 electrified vehicles by 2025 and, like many of its peers, it prefers using nickel-magnesium-cobalt batteries (EV pioneer Tesla's favoured battery technology that uses less cobalt). The study’s conclusions are in line with the International Energy Agency’s (IEA) latest outlook. The Paris-based institution said last week that the number of EVs on roads worldwide is set to more than triple by the end of the decade. The impact of a massive adoption of EVs is nothing but positive for lithium, cobalt and copper producers, metals that are key ingredients in the rechargeable batteries that power electric vehicles as well as electronics from mobile phones to laptops. Demand for those metals, the IEA and other industry experts say, could possibly rise tenfold, with EVs will overtaking consumer electronics this year as the largest source of lithium-ion battery demand, according to a separate study released last week by Bloomberg New Energy Finance. Some important issues, however, mainly corruption and often poor working conditions for miners in DR Congo, the world’s largest cobalt producer, will need to be addressed first. Copper, while no a battery metal per se, will also benefit from the expansion of the EVs market. Data released by the International Copper Association (ICA), an industry-funded body, shows more than 40 million charging ports will be needed over the next decade, consuming an extra 100,000 tonnes of copper a year by 2027. From those stations, at least 3 million will be built in China by 2030, according to the study. Consumption from the car industry will also weigh on demand, but later. An average gasoline-powered car uses about 20 kg of copper, mainly as wiring. A hybrid needs about 40 kg and a fully electric car has roughly 80 kg of copper (176 pounds). 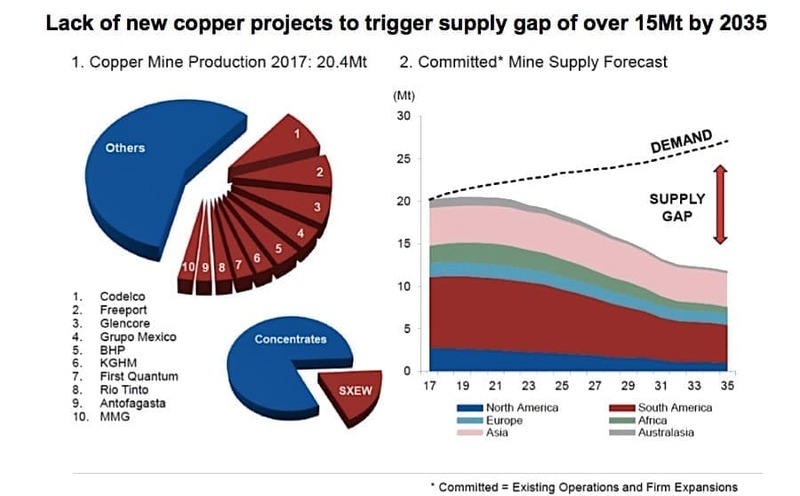 It means that, in the next decade, global copper demand will increase between 3 and 5 million tonnes, experts predict. Once electric vehicles become popular, they estimate demand to reach 11,000,000 tonnes of new copper for EV’s alone, with potential upside in other green technologies. Half cooked analysis. There won't be any job loss but more jobs will be created. More cars will be scrapped and replaced by EVs boosting the production for at the next 7-8 years. Savings on fuel cost will be spent on other items boosting demand for the services and goods. Did computers reduce jobs? Actually increased manifold. Only skill change. Solar power needs much more manpower to manufacture the panels, accessories, assembly and installation. With limited life of 10-12 years needing replacements. Jobs lost due to fuel engines and assemblies vanishing and lower car maintenance will be sure be more than replaced by this new jobs.